This beautiful cake is more apple than cake which makes it so moist and delicious. A dusting of powdered sugar is all the adornment it needs, although a little whipped cream never hurt anything.. 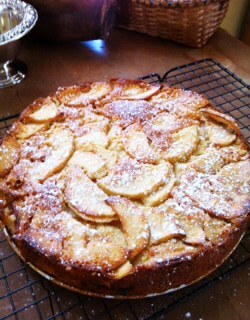 This entry was posted in Recipes and tagged Apple Cake, Breakfast, dessert, granny smith apples. Bookmark the permalink.